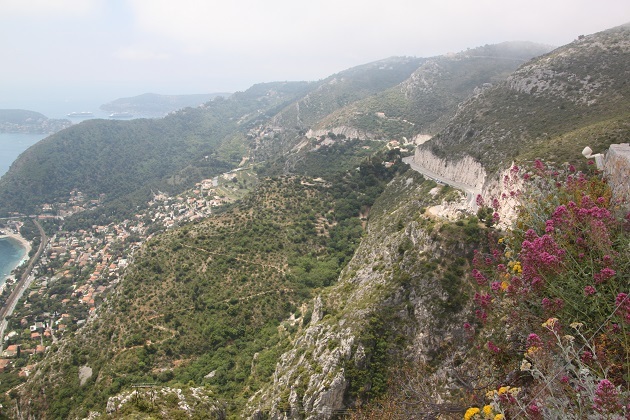 Climbing to the very top of the village of Eze involves plenty of steps and a bit of sweating, huffing and puffing thrown in for good measure. It is most definitely worth it. The streets and alleyways are lovely but right at the peak is the piece de resistance – the Jardin Exotique or Botanical Garden. This is something special. I must admit we dithered a bit about going inside. 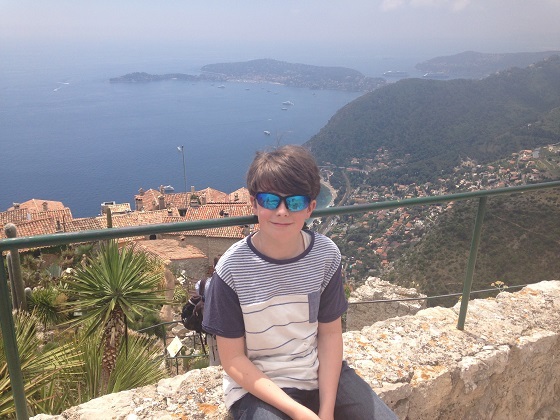 Son claimed he wasn’t too interested in walking around a garden, we were almost swayed by him then figured since we’d walked all that way up, were right at the gates and might never be back here – a no brainer we had to visit. I hadn’t done any research and had no idea of what to expect. It cost around 6 Euro to go inside, I have to say, even if you have no interest in gardens the admission fee is worth it for the views alone. 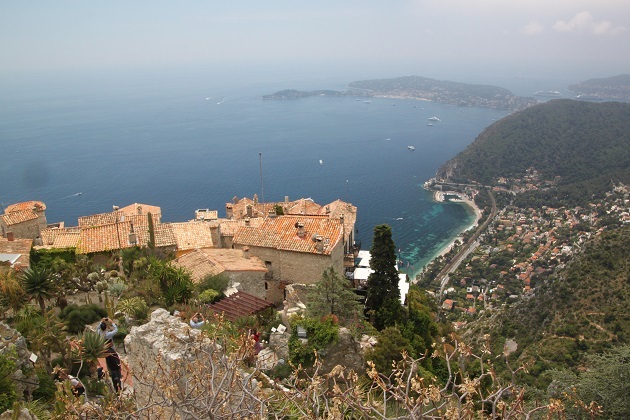 This is the only place in Eze where you can see down over the village rooftops to the sea and coast. A most spectacular panorama and unmissable. The gardens are pretty extraordinary too. 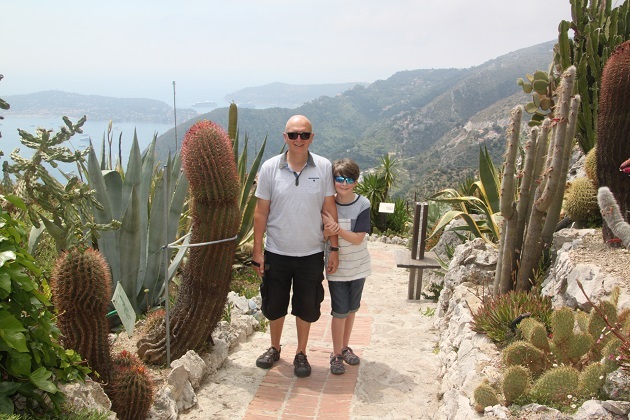 They seem to hang off the side of a cliff, are created in the ruins of a medieval castle and are packed full with impressive cacti and succulents from around the world. A micro climate here means all these fascinating plants thrive. 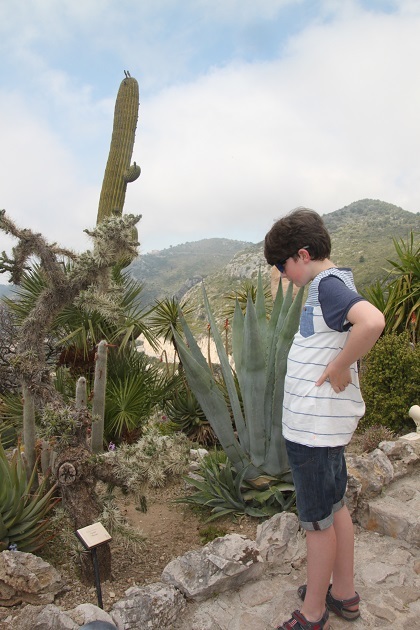 The cacti were impressive, a huge collection of all shapes and sizes.Son was especially taken with these. The paths are narrow, we found plenty of people in the garden but if you look there are also lots of quiet spots for sitting and chilling. We discovered a place towards the bottom with wooden seats, fountains and statues and more importantly shade from the sun. This was the perfect place to chill for a while, not too long though, those seats were not the most comfortable. 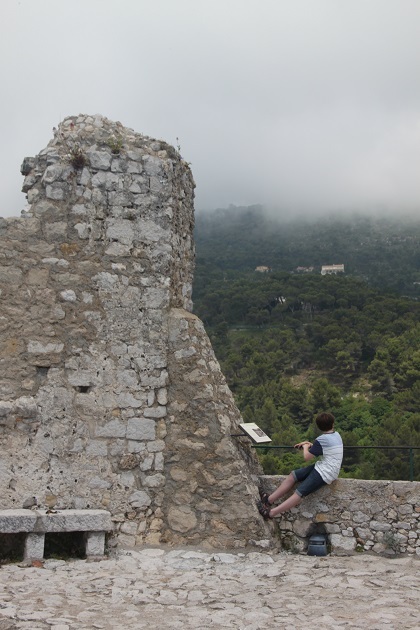 Refreshed and re-energised we climbed right to the very top and discovered the castle ruins and belvedere. More great views, an unforgettable place, an Eze must-see I am so glad we didn’t skip this out. What great views, it must have been a hard climb up! It is a steep climb but such lovely views all the way up you barely notice it! 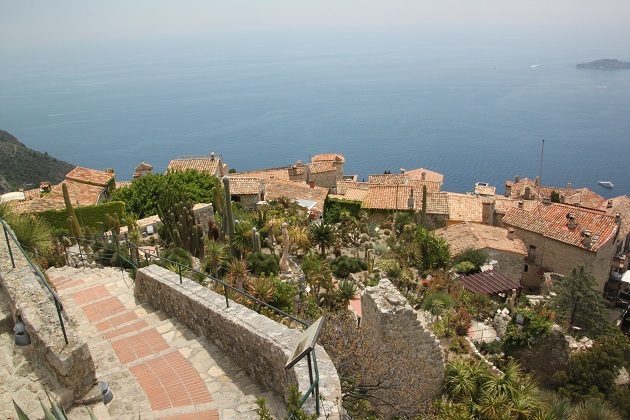 I think it’d be difficult for any botanical garden to trump the view of this one – that view of the sea, cliffs and village below is incredible! 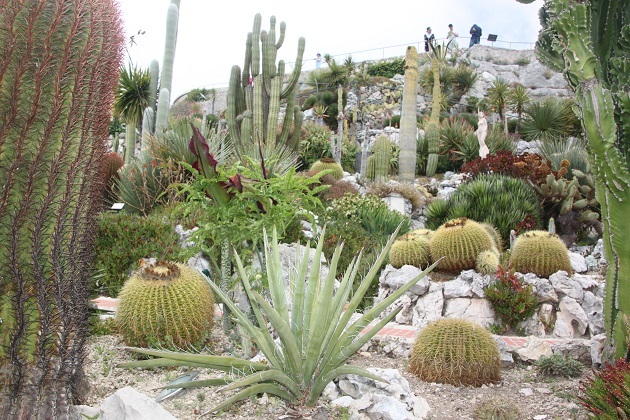 Fascinating array of cacti too – they’re one of my favourite plants so I love seeing all the different varieties! They’re just incredible aren’t they – so many colours and shapes, I loved them. Totally agree about the view too – it’s amazing. It is a beautiful garden for sure Suzanne but the views on top make it very special. Joy, those Mediterranean views are breathtaking! 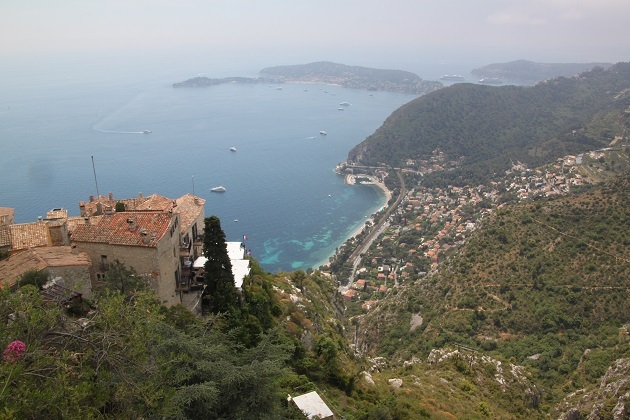 I hope we can return again to Eze! I know exactly what you mean Pam – I hope we can also return to this beautiful village someday. Thank you for the lovely comments!! Hope your day and weekend go well! 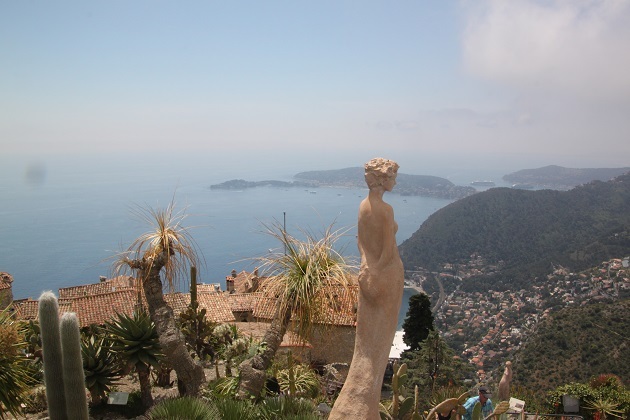 I’d almost forgotten about these gardens but remember visiting them now and being spellbound with those views. It was a long way back down for us though as we had to trek down to the main road below the village for the bus back to. Ice! That would have been a big trek, we had the car parking fiasco at the beginning but it meant a short walk out of the village. 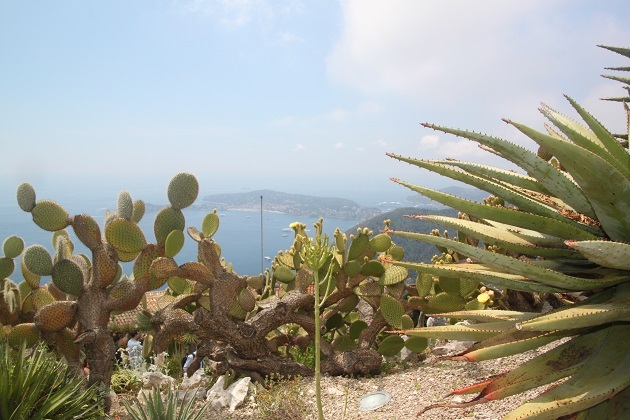 I just loved these gardens, the cacti and then those views are an incredible mix! It’s stunning isn’t it Kamila, I agree, how could anyone not love it! We did not go here, so I’m glad you share your visit so I don’t feel like I missed something wonderful! I’m glad we were able to show you the gardens, we nearly missed them too! What breathtaking views from the top – definitely a wise decision to visit the gardens while you were up there. I am really enjoying the vicarious traveling! Thank you so much Reggie! Those gardens were pretty special and I’m so pleased you “came” along with us! It’s a great place to take pictures. 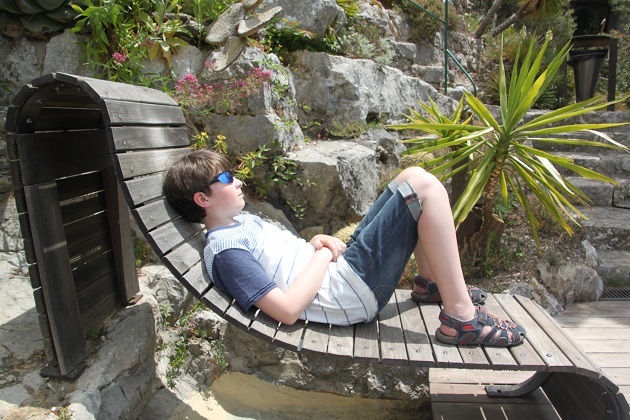 It’s such a gorgeous place Rosemary, I think our son heard the word gardens and groaned – he’s been to plenty before, none of which he’s ever been very excited by!! This place was completely different, we all loved it. It was incredibly steep but it was definitely worth the hike! Wow, this looks stunning Joy. Like secret garden meets exotic hide-away, and with incredible views! This is something I would definitely do! 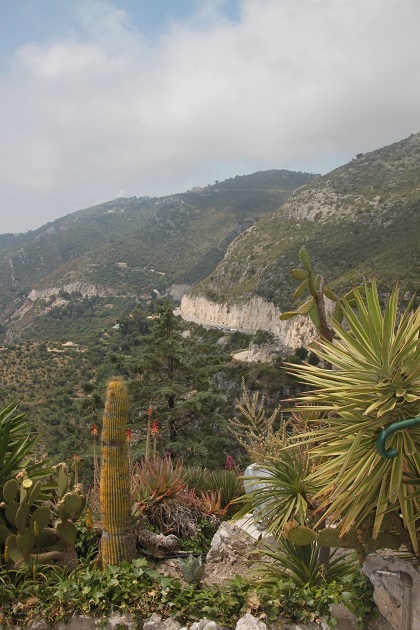 They are the most incredible gardens I’ve ever seen – all those cacti and then the views…..
Wow the views alone is already worth climbing to the top. Absolutely – those views were just stunning. Beautiful photos & great post! Thank you – it’s such a lovely place. I like succulents too so know exactly what you mean!